Namco Bandai made up for not bringing Splatterhouse to Comic-Con to demo for us by instead showing off this little title for XBLA and PSN. That's what I wanted to know, too. You play as Han Tao and you're looking to reclaim you Star of Destiny. It's a 2D brawler where main objective is to battle waves of enemies before moving onto the next stage. It takes after those 70's Kung-Fu flicks, so it's purposely very campy in that way. There's even a film grain overlay (which is hard to see) which gives it a bit more authenticity. It's suppose to be over-the-top in not only their moves, but their actions and animations. Namco Bandai was showing off two early stages on at their booth for the XBox 360. The demo took about 10 minutes to complete. I'm told it is "close to beta," but the expected release date is this Summer. Inside Levels: For now it seems most of the time you're either fighting outside or inside this cave area, but not inside any temples or places of worship. Trophies? : What is with developers not being able to confirm trophy support? There will be achievements, but trophies? Namco Bandai still doesn't know. How hard is it to simply take the Achievements and move them over to PSN for Trophies? Co-op? : Still not confirmed, but I imagine some type of multiplayer will be added. Tight/responsive controls: The controls feel good. Real good. 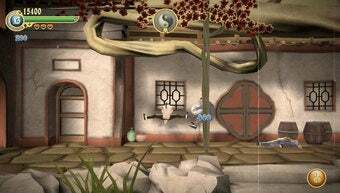 Level interactivity: Han Tao can interact with the level by swinging on tree branches or picking up barrels. These are all indicated by turning a faint red when standing nearby. It's a fun little game. It would be even more fun with your buddies. The difficulty is what I'm mainly interested since the demo was a little on the easy side.